Palestine: Sovereign State or Not? Palestine is represented abroad by the Palestinian Liberation Organization (PLO), and governed within its administrative area by the Palestinian National Authority (PNA), an elected government established by the PLO under the Oslo Accords. Though it faces frequent pressure and demands from Israel, the Palestinian government does not take orders from any country. Besides area C, Israel also controls all of the airspace and territorial waters associated with the West Bank and Gaza Strip. 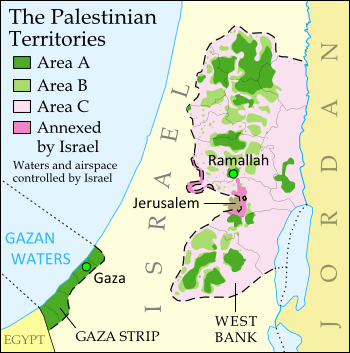 Additionally, it has completely annexed (integrated as part of the country) two sections of Area C itself: East Jerusalem, which both sides claim for their capital, and a strip of "no man's land" which was located between Israel and the West Bank when the latter was still controlled by Jordan. In other words, Israel controls most of Palestine's claimed territory, but not all of it. Since many countries don't control all of their claimed land and waters, that alone doesn't disqualify Palestine as a state. There are almost four million Palestinians living within the West Bank and the Gaza Strip, so this requirement is no problem. Even if we only count the West Bank's Area A, the Palestinian Authority has full control over close to one million people. By comparison, there about 40 U.N. member states with populations of less than one million. This requirement is also clearly fulfilled. Not only is Palestine seated as an observer state in the U.N. General Assembly, but its representatives also maintain direct diplomatic relations with 142 countries (even more than the number who recognize its independence), plus the European Union. It's also a member or observer in various international organizations. Palestine has its own government (the PLO/PNA), a defined and controlled territory (Area A in the West Bank), a permanent population (one to four million Palestinians), and the ability to maintain relations with other states. So whatever we think about what should happen in the future, Palestine does seem to qualify as a de facto sovereign state at the present.